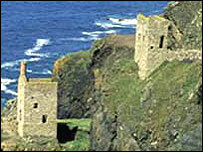 West Devon and Cornwall are to launch their bids for World Heritage status. The World Heritage Sites are run by the United Nations Educational, Scientific and Cultural Organization (UNESCO). Its aim is to encourage the identification, protection and preservation of cultural and natural heritage around the world. If the bid is successful it would conserve the landscape left by miners and recognise the contribution they made to the Industrial Revolution. East Devon and Dorset won World Heritage Status for the Jurassic coastline around Lyme Regis two years ago. Devon and Cornwall county councils hope the status will have a significant impact on visitor numbers. The official launch of the bid will take place in Truro on Thursday. The co-ordinator of the World Heritage Site, Deborah Boden, says the 225-page bid explains why mining sites in the South West need world-wide recognition. She said: "This is an extremely important bid, which will raise the area's international profile even higher, by explaining how hard rock mining and miners helped shape the world we live in today." The nomination document will be available to the public in libraries, Devon and Cornwall Records Office and mining heritage attractions. After a public consultation period, the final bid will be issued at the end of July.